It's the first of the year, and the magic of the season has slowly ebbed away into this tundra of a seemingly unending Winter. As I am working to wrap up the final sessions of the year 2017, I do still feel the wonder as I look at the faces I'm touching up and analyzing the skin tone of. For many people dear to me, last year held a lot of trauma; not the least of which for this young family who were unexpectedly hurled on a terrifying journey of life or death. Cancer is such an ugly, ugly, scary word for anyone. It was September when doctors started throwing that word around when it became apparent that something was seriously wrong with little Lincoln. You don't know fear like a mom and dad waiting for the diagnosis and hoping and praying and crying for it to "just" be Leukemia. But no, it was their worst fear; their precious little boy has Stage Four Neuroblastoma. When Kaitlyn reached out to me to set up a session she told me this season as a family is so important and she wanted to decorate her walls with it, "Because future Christmases aren't guaranteed," she said. That's a stone cold knife to the heart. When you have a vibrant but bald little three year-old fighting the battle of his life and you try to look into the blank abyss of the future, but all you can faintly decipher is a terrifying roller coaster of fear and hope and questions and... and, well, faith; because as I watch her walk this journey, some days faith is all that she and Matt have to hold on to. When you live with the brutal reality of not knowing what next Christmas is going to hold, or next month, or tomorrow... or even later today, you start to treasure every single minute where life and breath are still happening. As terrifying as this new way of life is to them, they have discovered a real gift of celebrating each moment together; a gift we all have that most of us take for granted. Lincoln, he is a breathtaking boy. I have never met a child quite like this little warrior. His bright eyes and beaming smile light up the whole world around him. Literally! He was barely out of his car seat when he was calling and waving excitedly to me, "Hi Brittney!!" He couldn't wait to take pictures. 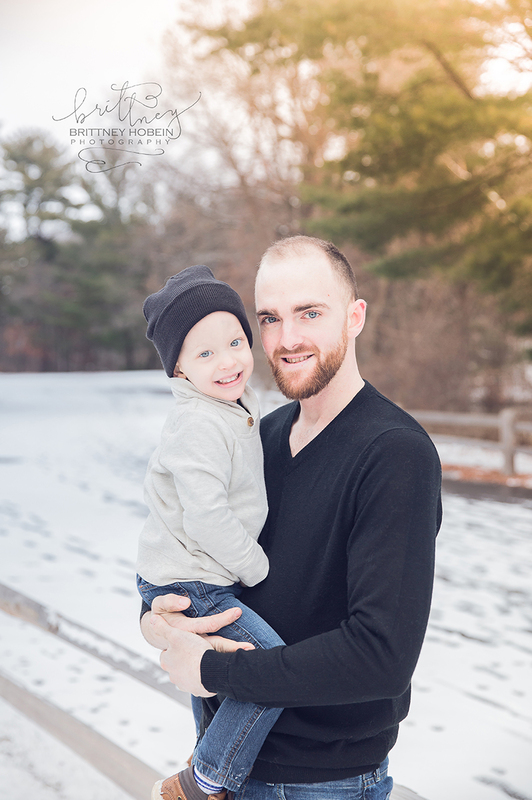 You would think having a photo session with me in the freezing cold was his lifelong dream come true. But then in that short time I spent with him and his family, I realized that every little exciting wonder he experienced--the snow, the icicles, a rushing river, making Bridger laugh, a rail fence, echoes, hand warmers and treats, a beautiful building that "smelt cool" (it had tigers in it, it smelt like cat pee, ha!) --was basically his lifelong dream come true. Suddenly all the lights turned on and Josh Groban's voice filled the park, There's no time to waste, there's so much to celebrate... You have everything you need if you just believe! 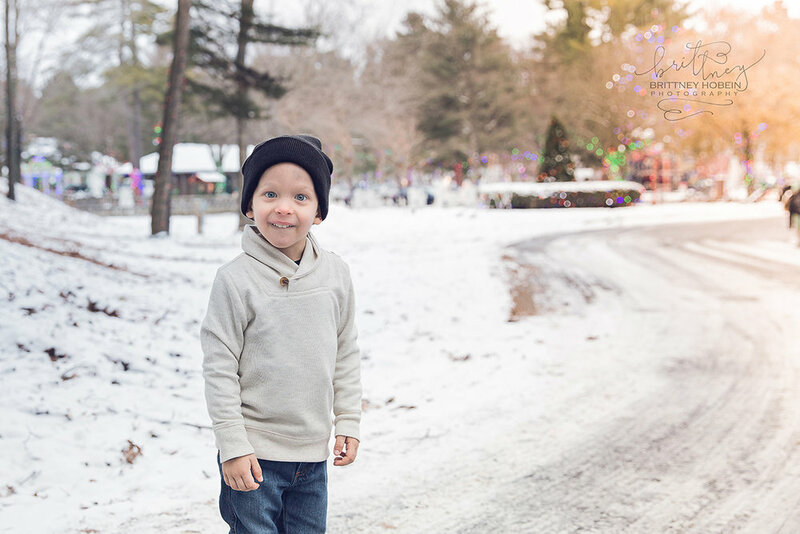 With colorful lights twinkling and Christmas music playing, Lincoln was dancing around the playground, calling to his daddy, showing his brother exciting things, and squealing with childish delight as he went down the ice cold slide. And in that moment, I was choking back tears because this dear, beautiful little warrior was somehow so magical; in all of the pain I know that this kid has to face every day, he was still living and loving to the hilt every minute of his gift of life. Lincoln sets a precious example of embracing life in all of its crazy and beautiful and heartrending and earth shattering glory, and celebrating it. The honest-to-God fact is that none of us are guaranteed future Christmases. Today is a gift; it's one of the best gifts you have ever received. Even the mundane is glorious because you have breath. There's no time to waste, there's so much to celebrate!